Safety, Income & Growth Inc. - Safety, Income & Growth and iStar Provide “SAFE/STAR” One-Stop Capital Solution for Multifamily Conversion in Washington, D.C.
Safety, Income & Growth and iStar Provide “SAFE/STAR” One-Stop Capital Solution for Multifamily Conversion in Washington, D.C.
NEW YORK--(BUSINESS WIRE)-- Safety, Income & Growth Inc. (NYSE: SAFE) and iStar Inc. (NYSE: STAR) partnered to originate a new ground lease and first mortgage leasehold loan on an 8-story office property adjacent to the George Washington University campus in Washington, D.C. The building is scheduled to be converted into a 153-unit multifamily building beginning in late 2019 by experienced developer Insight Property Group. iStar provided the leasehold acquisition loan and SAFE provided a newly created lease under their unique “SAFE/STAR” one-stop capital program. “This was an excellent example of iStar and SAFE partnering to provide a customized, flexible capital solution with a lower cost and reduced maturity risk in comparison to other alternatives,” said Jay Sugarman, Chief Executive Officer of iStar and SAFE. “The investment highlights the significant growth we have witnessed in Washington, D.C. as property owners begin to understand how a SAFE Ground Lease™ can be more efficient, unlock value and create a competitive advantage." This marks SAFE’s sixth ground lease in Washington, D.C. over the past year, providing approximately $300 million in capital for customers to acquire, recapitalize, develop, and redevelop high quality office, multifamily and hospitality assets in the city. The ground leasefeatures fixed annual base rent escalations and a 99-year lease term with CPI lookbacks every ten years. The existing 8-story office building will be fully renovated into a 153-unit multifamily property with a fitness center, lounge, and 3 roof decks. The property is a few blocks from the Foggy Bottom – GWU metro stop with access to three metro lines. 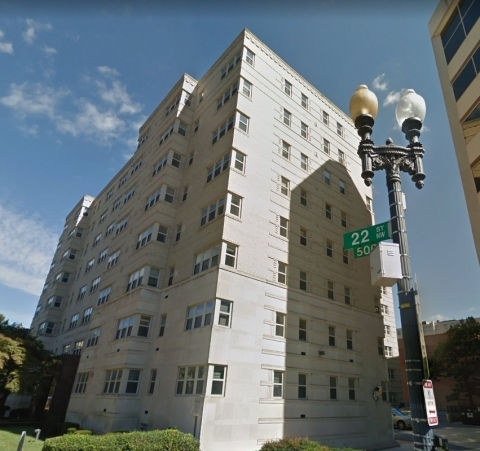 The building is located within walking distance to nearby shops, restaurants and tourist attractions including the White House and the National Mall. Safety, Income & Growth Inc. (NYSE: SAFE) is the first publicly traded company focused on ground leases. The Company seeks to provide real estate owners with better, lower cost capital through its modern ground lease structure, while delivering safe, growing income and long-term capital appreciation to its shareholders. The Company targets major markets throughout the United States, helping owners of high quality multifamily, office, industrial, hospitality and mixed use properties ranging from $25 million to $1 billion generate higher returns with less risk. The Company, which is taxed as a real estate investment trust (REIT), is managed by its largest shareholder, iStar Inc. Additional information on SAFE is available on its website at www.safetyincomegrowth.com.